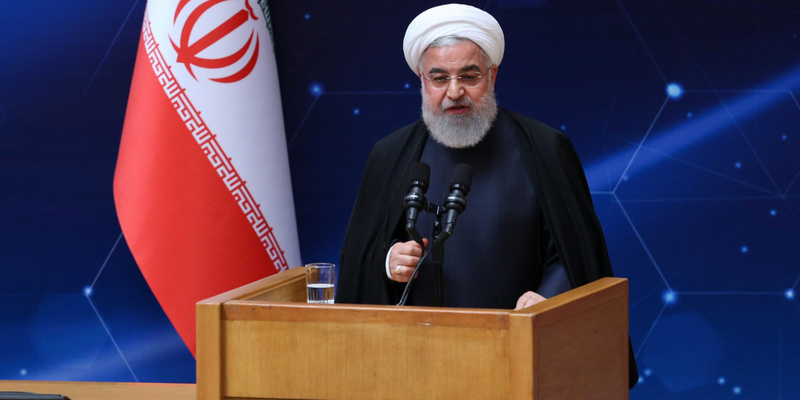 Iran’s President Hassan Rouhani has threatened to step up production of nuclear centrifuges, breaking a 2015 deal with the 5+1 Powers, following US designation of the Islamic Revolutionary Guards Corps as a “terrorist organization”. Under the July 2015 agreement with the 5+1 (US, UK, France, Germany, China, and Russia), Iran has strictly limited its research and development of new nuclear technology, including advanced centrifuges. But Donald Trump withdrew from the deal last May, before the US imposed comprehensive sanctions in November. Missiles are not covered by the 2015 accord, but European countries — whose suppport is vital for Iran’s troubled economy — have called for an agreement to cover the issue. Today, nobody in Iran supports your treacherous, outrageous government, and if you wanted to stop the Iranian government and State from pursuing its goals by sanctions, and dominate Iran and the region, be sure that you are mistaken. “One of the 5+1 members violated all its commitments and proved that it is not trustworthy. Therefore, we tell the remaining members that they have to focus on their responsibilities. We have waited and will continue to do so, but our patience has a threshold that if reached, the Iranian government and state may take steps, so think about that day. Iran has issued previous warnings that it will break out of the 2015 agreement with centrifuge development. After Trump’s withdrawal last May, the Supreme Leader issued a proclamation ordering the Atomic Energy Organization to prepare for the installment of the advanced units. The head of the AEO, Ali Akbar Salehi, pointed to new centrifuges in January when he said Iran would pursue “modern” production of 20% enriched uranium — still civil-grade, but capable of being enriched further for military use. There is no sign that Iran has embarked on the centrifuge development, but the US measures against the Guards — the first time that Washington has declared part of a foreign government as a “terrorist organization” — have revived the prospect. Salehi said at the Nuclear Day ceremony, “Iran is continuing to produce and upgrade centrifuges in the framework of JCPOA”, but claimed “114 new nuclear achievements, ready for exploitation”. Enemies have failed to achieve their goals in the region, knowing that the IRGC has had a leading role in their defeat, so they are angry and therefore they resort to unwise measures…. The Americans should know that they are the source of oppression, cruelty and terrorism in the region, and regional countries, particularly the Iranian nation, have rushed to help one another in hard times, with the IRGC playing an outstanding role in this regard. Why threaten, just do it. If you get lucky you get more of your people to starve.